In comparison, about half of the "baby boomer" generation, born just after World War Two, were fat at that age. Spokeswoman Prof Linda Bauld said: "Extra body fat doesn't just sit there; it sends messages around the body that can cause damage to cells. "While these estimates sound bleak, we can stop them becoming a reality. "Millennials are known for following seemingly healthy food trends, but nothing beats a balanced diet. "Eating plenty of fruit, vegetables and other fibre filled foods like whole grains, and cutting down on junk food is the best way to keep a healthy weight." 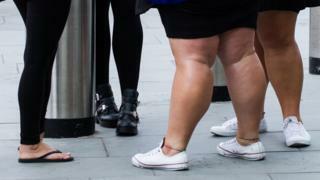 Prof Russell Viner, from the Royal College of Paediatrics and Child Health, said: "There is a danger that being overweight is becoming normalised, as we know that many people struggle to recognise obesity in themselves, and often are unable to see when their child is overweight.